NEW YORK — Garnier continues its expansion in the hair color sector with the introduction of the revolutionary new Virtual Shade Selector tool with ModiFace. Grounded in consumer research, Shade Selector assists hair color shoppers in finding their best hair color match using personalized technology. The top product-related purchase barrier to the at-home hair color category is the ability to find the right shade, and now the Virtual Shade Selector with ModiFace provides consumers with a realistic hair color application, creating a bespoke and convenient pre-shopping experience. With Shade Selector, shoppers can find their Garnier hair color match in 60-seconds online and in-store, virtually trialing the range of Garnier shades personally recommended to them so they can purchase with confidence. Shade Selector first launched through a website interface, accessible on a phone or computer, bringing state-of-the-art technology into homes and the hands of hair color shoppers. In a first-ever endeavor at mass retail, the tool is rolling out an at-shelf version, so shoppers can identify a shade that meets their needs, and test the color on virtually before leaving the store. 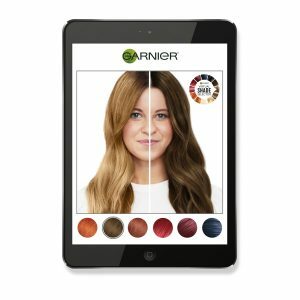 At display screens at-shelf, the virtual education tool encourages shoppers to learn about and test all permanent Garnier Hair Color options, including Nutrisse, Olia and Color Sensation. Shoppers will be prompted to take the one-minute diagnostic test, and through the integration of best-in-class 3D technology fromModiFace, users can virtually try on a range of recommended Garnier shades. To ensure an accurate recommendation, the tool takes each user’s current hair color, level of gray, and desired end look into account. A barcode scanning option has been incorporated to allow users to engage with the tool outside of what is recommended, so they can try on all Garnier shades available at shelf. Additionally, Beauty Advisors will be onsite at select locations to assist and provide live feedback in Walgreens stores. During the recent Nutrisse campaign shoot, Garnier Brand Ambassador Mandy Moore tested the innovative tool, trialing various hair color shades from the Garnier portfolio to prepare for her next hair color change. The Virtual Shade Selector with ModiFace technology launches at 37 locations at select retailers in 2019. Walmart is piloting the program with 10 locations beginning this month; those store locations included. Wakefern (5 locations) and Meijer (12 locations) will launch the tool in-store beginning in March 2019; Walgreens (10 locations) will release the tool in-store in June 2019. This pilot program will be available to shoppers for one year. Users are encouraged to tag @garnierusa and share their photos through social media channels. To see the technology in use, visit GarnierUSA.com/ShadeSelector and @mandymooremm, or visit a Shade Selector store location. A store locater will be available on GarnierUSA.com in March 2019.